The bane of man. If it hadn't been for missus' constant nagging reminder, I would have conveniently forgotten about them. I am certain God thought Adam had procrastinated far too long in naming all the animals He had created. Left alone, I reckon Adam will still be naming them today. No wonder God said Adam needed a helper. And a secretary. Remember to thank missus, dear readers. Here's Part One to refresh your memory. We travelled from Hobart to Bicheno. 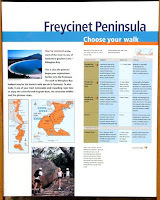 Along the way, we visited the Freycinet National Park. The park is very scenic and beautiful. I was told the hike to reach the Wineglass Bay lookout used to be >2 hours from the old carpark. I believe the Tasmania Tourism Board decided to spare tourists like me from fatigue torture and had constructed a new carpark further uphill. It now takes 1 - 1.5 hours. The hike up was totally worth the view as you can see below. I think it retorted, "Are you crazy?!" Do you see the mountainous backdrop in the photo below? The Wineglass Bay is just behind it. No wonder the smart wallaby refused to tag along. After spending a night in Bicheno, we continued our journey to Launceston. Launceston is much smaller compared to Hobart but definitely more bustling than Bicheno. Bicheno feels like a surfers' town. We visited the Penny Royal World & Gunpowder Mill. Unfortunately it was under renovation and closed to public. There is also a nearby hand-made sweet factory named Gourlays Sweet Factory. I have been wanting to publish this testimony that I had written in early 2009 and emailed to my friends. Now I wish to share it with you readers. May you be blessed by the goodness of God. Wishing you a blessed 2009. I executed a project implementation on 2 Jan. Towards the end of the day, I received an email from a senior manager (whom I shall call Cathy) from my client company. She had accused me of executing the implementation without her approval. To add fuel to the fire, another manager from the client company (who was covering for the approvers on leave) had said that no approvals were required since the implementation was not pertaining to any production environments. I called Cathy to explain the situation. She was furious and adament that I had flouted a very serious offence. Before putting down the phone, she would escalate to the senior management accordingly. Though she was rather rude and aggressive throughout, I responded politely and professionally. Initially I did not take her threat very seriously until I read her email sent within the next few minutes. It was addressed a very senior vice president in US (whom I shall call Dave). He was the senior project executive handling my client account. To make matters worse, this email was copied to all the senior directors of her company. I was pretty much in a state of shock. I immediately forwarded the email to my reporting manager lest he gets a call from US. I doubt he could do much since it had bypassed even the technology head in Australia. It was already close to dinner time and we had already decided to eat out. While driving, I told Selene that whatever the situation, it would be turned into my favour. Somehow God is going to change the bad spotlight into a blessing where my name will be remembered well among the senior management of both sides. Of course things are easier said than done. My human nature reared its ugly head. At 4:30am I woke up feeling concerned. How God can save me goes against all human logic and reasoning. How could I sit still and do nothing? I brought out my laptop. Perhaps I should pen an explanation to Dave and copy a few senior managers to back me up. I felt trapped and hopeless like the Israelites. In front of me was the vast Red Sea and behind me was the marauding Egyptian army. With despair flooding my soul, all I could think of were the 'what-ifs' scenarios. What if I had lost my job? I have a house mortgage to pay and I am the only breadwinner. Already many companies are retrenching their staff. Would this not be a good reason to fire me? Would God bless me with this job and yet take it away from me? I was settling for the best scenario where I would get a stern 'tick-off'. Admist my fear, God's still small voice spoke. Just a word "Shalom". Peace, be still. My raging sea immediately lapsed into tranquility. "I will be your Shield and Mighty Tower. The battle belongs to the Lord." And behold, a new mail alarm box popped up. Dave had replied her email. To summarize he sternly told Cathy off (our client, mind you) and that he did not like her tone. He would not conclude without knowing the facts. Five minutes later, I saw Cathy's reply. I thought miserably, "This could well turn into a open war with each senior director taking sides and pouncing on each other's throats!" To my astonishment, Cathy apologized. No, you did not hear me - she APOLOGIZED for her tone and will instead better her communication skills. Her email was sent to the same distribution list of seniors. She mentioned that she would also work closer with my company to improve the process. As if it wasn't enough, she sent me a personal note (copying Dave) to ask me to accept her apology. She would like to treat me to a cup of coffee as an apology. Even my manager was stumped! Anyway, he was in the midst of replying to Dave when I informed him the matter was settled. Woot! Praise God! Imagine if I had tried to explain. As God told Moses and the Israelites to "Stand still and see the salvation of the Lord", God had perform the same miracle and opened up my very own Red Sea! The good news for everyone is - God is still in the business of opening up our Red Seas today. He is the God of the impossible! Now how victorious can it be? Too good to be true? I beg to differ because I have an awesome Father. If God is on my side, who can be against me? God didn't say there won't be any weapons formed against me. But He did promise that those weapons formed against me cannot prosper, and every judging words against me shall be condemned. Hallelujah! Now I have an even deeper understanding of being 'more than a conqueror' in Christ. It simply means Christ will fight our battles and all we need to do is rest. Once the battle is over, all we need to do is pick up the spoils of war. We are already victorious through a battle we didn't fight. Now that is more than a conqueror! Remember Simon Peter? Jesus told him to let down his nets. And Simon hauled up a net-breaking, boat-sinking, load of fish. So much that he had to yell for the other boats to help him. Who attracted the fish to the boat? Jesus the Conquerer. Who got the spoils? Simon the more-than-conquerer in Christ. That's you. That's me. That's for everyone who believes in Him. There is a catch though: you simply have to REST and TRUST Him who is able. Many people have lost their homes and loved ones in one of Australia's worst tragedy. If you wish to donate, go to the Australian Red Cross website (more details). Let us provide whatever assistance to the victims, be it through prayer and donation (financial, clothes, blood). For my Singaporean friends, I am alive and well. Thank you for your concern. These are my thoughts and opinions in response to a certain dream from a person named Danny Nalliah linking abortion laws to the bush fires (read here). I have been waiting for preachers to come forward and proclaim God's judgement upon Australia and Victoria. Seems like it's so common these days - doom and gloom. If they really had a word (or dream) from God, I'm sure the disaster would have been averted if they had stood up before then. No offense, gee anyone could have done it, with or without a word of knowledge. Even a terrorist claims his god is just and mighty in the 911. If you want to see here how a disaster was averted as God gave a word of knowledge, see here (in Youtube) by a healing evangelist named TD Joshua. For info, see the other videos how a leg cancer was healed and also how a dead man had been raised. So what is the difference between us Christians and the rest of this world? The BIG difference is while we were lost in sin, our God came down and showed us how much He loved us by dying on the cross for us and saved us from the uttermost. All these He had done while we were still deep in sin. How can anguish and agony and death bring glory to God? The God I know who loves the world enough to send his Son to die for us while we were sinners. If his theory holds true that God is judging the world, He wouldn't have sent a saviour. He would have sent a destroyer. And God didn't send a destroyer, He sent His own Son whom He loves. Since when in the bible has God's wrath brought repentence? Rom 2:3 clearly states "So when you, a mere man, pass judgment on them and yet do the same things, do you think you will escape God's judgment? 4Or do you show contempt for the riches of his kindness, tolerance and patience, not realizing that God's kindness leads you toward repentance?" Read again. God's kindness leads us to repentance, not His wrath. If it was His wrath, the people of Israel would have turned to God. But they didn't. See the Samaritan woman example. It was an encounter with Jesus and His love for her that brought her change. Jesus didn't condemn her at all. Look at the woman caught in adultery. Jesus said, "Neither do I condemn you, go and sin no more." When people know how much God loves them in Jesus Christ, they will change and sin will lose its hold. The more we focus on sin and how we should address it, the more we give sin power and sin consciousness and will soon get entangled in its snare. What about Jonah? Didn't God's wrath was averted when Jonah preached and the Ninevites repented? Read carefully again. Jonah's words were "That is why I was so quick to flee to Tarshish. I knew that you are a gracious and compassionate God, slow to anger and abounding in love, a God who relents from sending calamity." Jonah knew his God. Do we? Anyway, he was to preach that God loved the Ninevites in spite of their sin. Instead he preached judgement. And he had hoped that through the message of judgement, they would turn further away from God. See Jonah 4:1 "But Jonah was greatly displeased and became angry." If he knew they would be changed with his preaching on wrath and judgement, why would Jonah be angry? And "5 Jonah went out and sat down at a place east of the city. There he made himself a shelter, sat in its shade and waited to see what would happen to the city." Jonah was expecting judgement to come upon the city. However God had compassion and by God's grace, the city repented and was spared. That was why God asked Jonah, "Why are you concerned for a vine you did not grow? If you can be so concerned about a mere vine, how much MORE am I concerned about the city who knows neither its left hand from its right hand!" The world preaches doom and gloom all day. God through Jesus preaches love and hope. We the church are not like the world. Disasters and calamities are NOT from God. The keys of this world had been given by Adam to Satan when Adam fell. Satan still rules and holds sway in this world on how it is run. However the good news is his time is limited when Jesus died on the cross. Jesus is restoring what the first Adam had lost to us His bride. Not only that, He is giving us greater honor than what the first Adam had because Christ is the firstborn of the new Adam. God is putting every enemy under Jesus' feet and the last enemy is death. This is an on-going process and each day Satan is losing his grip while more and more people turn to Christ. However one day, we will be raptured and that's when Satan's full fury and anger will be unleashed on the earth. "We are light and salt of this earth" - our presence are vital to the world not going amok! In the old covenant under Law, when a person sins, he has to pay for his sins and curses follow through. Sometimes this comes in the form of diseases, disasters, failed crops, drought, etc. It is not that God brought the curses. How could God be evil? Rather God had to remove his protection and that was how Satan could enforce disasters and diseases upon a person. Eg. The snakes in the wilderness. All these while the snakes had been there with the Israelites. But God protected them from the snakes until the Law came. Then God had to be the Righteous Judge and remove His protection whenever the Israelites sinned. In the new covenant in Jesus Christ however, all sins of mankind had been put on Jesus' body at the cross 2000 years ago. There is no more curse on a believer in Christ, UNLESS the believer chooses to believe he can still be cursed under the old Law covenant. For further read, read my response here on the global economic recession.